When my husband and I combined our finances, our first goal was to start saving for an emergency fund. At that point, we were planning to quit our jobs, move to Colorado and become self-employed. To do that, we really needed an emergency fund as a safety net…but we would also need a “go to hell” fund to make choices with our business and our lives. First, we saved up six month’s worth of expenses, which allowed us to make the journey from full-time work to self-employment without skipping rent or dining on Ramen. We used it when assignments were slow in the summer so we didn’t have to scramble for work. It also provided a safety net for us should something have gone wrong financially. That emergency fund has made it possible for us to be self-employed, but it wasn’t the only thing we needed. We also needed a “go to hell” fund. This is the money that’s given us a sense of agency when it comes to choosing clients and making financial decisions. It’s given us the option of saying “go to hell” if we have to. And that’s powerful. Having an emergency fund is only designed to provide financial support should you encounter an emergency. This could be anything: from a car accident, medical issue, family emergency, or losing your job. It’s a safety net until you get a new job, start earning an income again, or get back on your feet financially. Everyone should have an emergency fund, because emergencies happen. The Farmer’s Insurance commercials on TV highlight it best – you never know when a rodent is going to crawl up your leg and make you floor the gas pedal, causing a 5 car pile up in front of your kids’ school. Stuff happens – that’s life. Having an emergency fund simply means you’re prepared financially for life. But an emergency fund isn’t designed to give you control. It’s designed as a safety measure. Your “go to hell” fund is designed to give you control. Who hasn’t fantasized about leaving their job to pursue a passion or side business? Some reports say a third of Americans are currently looking for new work, while almost 75% would consider a new job if the opportunity arose. Unfortunately, finding a new job likely requires you to keep working at your current gig until you find something else. Most people can’t afford to be without work for weeks or months, especially since you can’t collect unemployment if you quit voluntarily. That’s where “go to hell money” comes in. My friend Ellie used her savings account to sustain her after she quit a soul-crushing job working as a telephone customer service operator. She lived on that money for a couple months until she found a new job that aligned with her passions and talents. Without that savings account, she wouldn’t have been able to quit her job, get an internship at a nonprofit and eventually find a full-time job there. “Go to hell” money isn’t about the desire to tell off your boss – it’s about choices. When you’re living paycheck to paycheck, your choices are severely limited by the need for consistent income. This lack of independence will wear you down over time, and take the shine away from what could be a fulfilling and interesting life. Don’t be a wage slave. Take control of your life by taking that control away from your employer. Your “go to hell” fund will help give you the control to walk away whenever you want: whether you’re an employee, freelancer, or small business owner. The hardest part of determining your “go to hell money” amount is really a life question, not a money question. How much you need is more a choice of what freedom means to you, what you’re willing to do, and what you want in life. It could mean, simply, quitting your hourly job. And given the job, it might not be hard to get another one quickly. It could also mean going out and starting a business. In that case, your “go to hell” fund is going to need to be much bigger. Emergency fund first, “go to hell” fund second. Emergencies can happen at any time. That’s why you have to have both an emergency fund and “go to hell” money fund. What happens if two weeks after you quit your job, you get into a car crash? 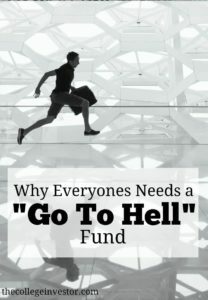 Your “go to hell” money is above and beyond your emergency fund. Determine how much you need. Everyone’s go to hell fund is different, depending on how much of a runway you need. Because I’d already been freelancing for several months, I was certain it wouldn’t take long to earn enough money to live on. Other businesses need more time to get started, so a year’s worth of expenses may be more applicable. That’s why it’s usually a good idea to side hustle and have some options for earning more money already awaiting you. Put all windfalls toward your emergency and “go to hell” money. One of the easiest ways to save for an emergency fund is to allocate all unexpected windfalls to your emergency and “go to hell” money funds. I primarily used wedding gifts, tax refunds and side income to build our fund until it was complete. Save all raises and bonuses. While you still have a full-time position, use those benefits to plan your exit. Anytime you get a raise, bonus or promotion, save the difference instead of spending it. Think about it like this: would you rather buy a new Michael Kors purse or be able to quit your job a month sooner? But don’t be impatient about it either – if you’re expecting a large bonus in a month or two, can you wait it out or take vacation in the interim? There’s no reason not to milk your employer as long as possible. Temporarily cut expenses. Saving thousands of dollars is often only possible when you brutally limit your expenses. Try cutting back for a few months until your fund is set up. Limit spending on eating out, alcohol, shopping, concerts and movie tickets. Do you have “go to hell money” saved up? Wow, very new take on maintaining control at work but I like it! I agree, the emergency fund should only be used for absolute emergencies. The “go to hell fund” is a very empowering method to give a lot of people power and decision making ability. It really helps to know that you don’t have to be that afraid of losing your job anymore. That power is huge. I’ve found that it can take people from hating their job to loving their job, simply because there is the backstop of security.